Emotions are often extremely linked to what is going on in your life. There are dozens of chemicals in the brain that produce the moods that you feel, and life choices and changes can alter the levels of these chemicals. 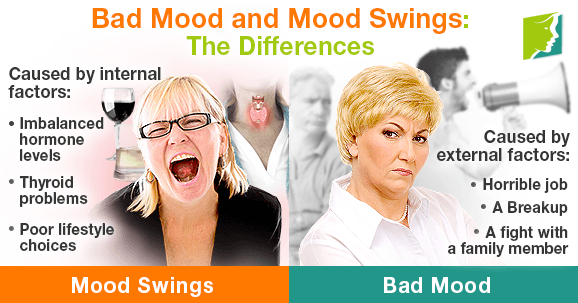 Both bad moods and mood swings can have you grumpy, irritable, depressed, and fatigued. While they appear to be and feel very similar, if you were to experience them side by side, you would notice some subtle differences. At the same time, the causes of each are quite different. There are several chemicals in the brain that should be at adequate levels to maintain a feeling of well-being. Different alterations in your body or life can affect their levels. Some of these chemicals, which are really chemical messengers called neurotransmitters, include dopamine, endorphins, serotonin, oxytocin, gamma-aminobutyric acid (GABA), and cortisol. Dopamine is in charge of feelings of pleasure, as well as the ability to focus and learn. Endorphins are responsible for decreased stress by way of increased exhilaration. Serotonin is responsible for sustained feelings of happiness. Oxytocin inspires feelings of loyalty and friendship. Cortisol is actually a stress hormone that is sometimes activated unnecessarily, resulting in anxiety and panic. As you can imagine, many different factors whether they be work, friendship, or family related can alter the levels of one or more of these brain chemicals. When something happens in your life, whether it be a horrible job, a breakup, or a fight with a family member, it affects your mood. Bad mood can also be a side effect of illegal drugs, and sometimes even pharmaceuticals. All of these causes can lead to a decrease in select neurotransmitters, causing you to have a temporary dip in emotion until either the situation is corrected, or you re-center and move past it. While you can usually trace a bad mood down to its origin, mood swings are far more random, chaotic, and unpredictable. In fact, most of the time, there is no reason whatsoever for you to have a mood swing that can be determined from your exterior life. This is because mood swings are internal. They are a result of imbalanced hormone levels whether from thyroid problems, menopause, or poor lifestyle choices. When your hormones are off balance, they directly impact levels of happy neurotransmitters in the brain. The sudden change in your body can cue the release of cortisol and make you very stressed, as well. If you lead a healthy lifestyle with adequate exercise, a balanced diet, and quality time with loved ones, you will be more apt to overcome mood swings and bad moods. Although hard to deal with at the time, they are both extremely temporary and likely do not require medical attention. Only if your depression or anger goes on continuously for five days or more should you begin to worry that it is severe depression or bipolar disorder. If you ever have thoughts of suicide, as well, you should get help right away, as this is not typical in bad mood or mood swings.